An amazing presentation from a group of school students was the final act for phase one of Project Hotspot. Project Hotspot is run through schools and supported by scientist and community groups. Students from Highlands Intermediate School and Oakura School have been working on their action plans with the Project Hotspot Team. The children formed groups and started their research of investigating potential threats to species within the Tapuae Marine Reserve. The Taranaki based Participatory Science Platform (PSP) project is driven by Nga Motu Marine Reserve Society and funded via Curious Minds Taranaki which is administered locally by VTL. The PSP is currently being piloted in three areas: South Auckland, Taranaki and Otago. It is an initiative under A Nation of Curious Minds, a Government programme to encourage all New Zealanders to get involved with science and technology. Highlands Intermediate School groups were the Ticket Team, Predator Posse and Dog Control Crew. Cassidy Taylor (12) and Jess Camden (12) represented their group who focused on plastic parking machine tickets. “Our project was to make parking tickets biodegradable as they are a danger to marine life. We found 24 tickets in half an hour,” said Cassidy Taylor. The parking machine tickets were put in a blender with sea water and then as a comparison they used normal paper with sea water. “The ticket just washed around and around with sea water in the food processor and it didn’t do anything. When we did the same test with paper it destroyed it all up,” said Jess Camden. The girls have contacted the New Plymouth District Council with their findings and are now working to phase out the tickets with something environmentally friendly. They will also raise the awareness of the app Pay My Park to stop the issue of tickets completely. The girls are part of a Science Club at Highlands Intermediate School run by teacher Pat Swanson. 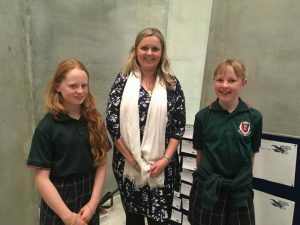 “Project Hotspot started for me in 2014 when Dr Victoria Metcalf came to visit my class at St Pius X School, along with Lucy Graydon from Venture Taranaki who is the regional manager for the PSP pilot. 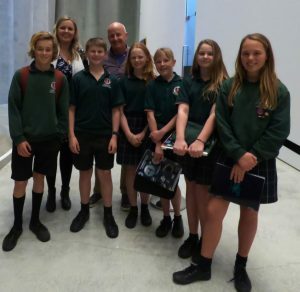 “They had heard of the success of action projects my class had done as part of the Experiencing Marine Reserves Programme, and they wondered if this could be the seed for projects in Taranaki,” said Pat Swanson. He said that in 2015 A Nation of Curious Minds funding was put utilised to develop a Participatory Science Platform pilot in Taranaki. A consortium was formed to apply for funding and develop a project around threatened and significant species in Taranaki, identifying occurrence and distribution of these species, and possible threats. Students from various schools were involved in designing the project and developing a timeline. “In 2016 I began a new role as science specialist teacher at Highlands Intermediate School and I formed a Marine Studies Group. “Project Hotspot formed a key part of my learning programme. The students identified and followed through with the projects that were then presented at the Project Hotspot end user workshop. “We hope that some of these projects will be ongoing. Oakura School groups were the Footprint Whanau, Litter Legends, Micro-plastics and CoastBlitz Crew. Reuben Kiss (11) and Israel Mead (12) represented their group Litter Legends. “Our project was to see if any rubbish we found was the same as the top ten items found in the rest of the world. We found 71 shot gun wads in half an hour,” said Reuben Kiss. “I care about the environment and marine life and want to see penguins back around this area. I want to clean up our reserve making it safer for the wildlife to come back and survive. The Litter Legends found that the composition of litter in the Tapuae Marine Reserve was different to the rest of the world. They found fishing line, veterinary syringes, plastic shotgun wads, rope, bottle caps and plastic bags. The top 10 international items are cigarette butts, takeaway food containers, plastic bottles, plastic bags, bottle caps, plastic cutlery, glass bottles, straws, cans and paper bags. “I want to see less rubbish in the marine reserve. People need to pick up their plastic rubbish so it doesn’t get into the waterways,” said Israel Mead. The boys are part of a science group at Oakura School run by teacher Gillian Sturmer. “I did a six month science fellowship last year with Department of Conservation and have a close interest in our environment. “On my return to school I was contacted by DOC in conjunction with Emily Roberts from TRC to see if our school would be interested in hopping on board with the Hotspot Project. Of course I jumped at the chance,” said Gillian Sturmer. Gillian Sturmer said that Emily Roberts and Allen Stancliff from Fish & Game did some detective work and discovered that the shot gun wads came from as far away as the mouth of the Waitara River. “Hunting & Fishing do not sell this type of shell but people coming into the region may bring their own, so also we need to contact the Clay Bird Shooting organisation. The children shared their field work experiences and science experiments as part of the project’s Pre-workshop End User Report presented by Dr Emily Roberts. Marine Ecologist and Project Hotspot team member Dr Emily Roberts wants Project Hotspot to work with the community to ensure New Zealand wildlife will be around for many years to come. “I’m delighted with the range of end users that attended the workshop today. There were so many positive outcomes and actions resulting from everyone’s hard work. National Co-Ordinator for Participatory Science Dr Victoria Metcalf helped develop the platform and oversees all the activity of the three regions in the pilot. “The funding itself comes from the Ministry of Business Innovation and Employment (MBIE) together with the Ministry of Education and the Office of the Prime Minister’s Chief Science Advisor who have teamed up to help deliver this activity,” said Dr Metcalf. Dr Metcalf was impressed how the project was working with the community in a constructive and engaging way for a positive outcome. “Project hotspot itself is a really good example of what can be done with this community science funding and I am really learning today how much it is changing people’s lives. The presentation from the children made the participants aware of how many products end up in our waterways in turn harming the wildlife.